One of the most ancient of toy dogs, the Affenpinscher originated in Central Europe (Munich, Germany and France), where they earned the nickname “little devil with a moustache.” During the 17th century, small terriers were frequently kept around stables, on farms or in stores where they served as ratters. Bred down in size, these small terriers became companions in the home and kept mice from overrunning their mistresses' boudoirs. 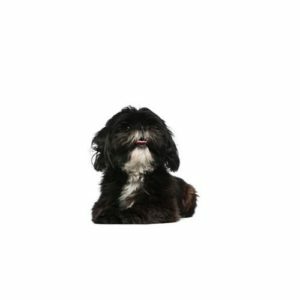 Affenpinschers have a fun-loving, sometimes mischievous, personality. Their intelligence, appearance and attitude make them a good house pet, but children should always be taught how to properly handle the dog. Their small size makes them ideal for an apartment. They are very active indoors and most of their exercise needs can be met with indoor play, but they enjoy daily walks. Their wiry coat should be brushed and combed twice a week and trimmed twice a year. Toy Group; AKC recognized in 1936. Ranging in size from 9 to 11?_ inches tall at the shoulder. The Affenpinscher is a balanced, wiry-haired terrier-like toy dog whose intelligence and demeanor make it a good house pet. Originating in Germany, the name Affenpinscher means, “monkey-like terrier.” The breed was developed to rid the kitchens, granaries, and stables of rodents. In France the breed is described as the “Diablotin Moustachu” or moustached little devil. Both describe the appearance and attitude of this delightful breed. The total overall appearance of the Affenpinscher is more important than any individual characteristic. He is described as having a neat but shaggy appearance. A sturdy, compact dog with medium bone, not delicate in any way. Preferred height at the withers is 9 1/2″ to 11 1/2″. Withers height is approximately the same as the length of the body from the point of the shoulder to point of the buttocks, giving a square appearance. The female may be slightly longer. Are you interested in purchasing a Affenpinscher?